Squadrons began to spring up through the Nation, including Florida. The Sons in Florida did not have a formal organization beyond the Squadrons that were chartered. Detachment of Florida began getting organized during the mid to late 1960’s. This lead to our First Detachment Commander being elected in 1970. Over the last 4 decades the Florida Sons, under the direction of the many Detachment Leaders, have prospered. Our membership has grown to over 19,000 members and over 180 Squadrons across 16 Districts and 6 areas. Since 1988, the S.A.L. has raised more than $16 million for The American Legion Child Welfare Foundation, S.A.L. members have volunteered over 320,000 hours at veterans hospitals, and have raised over $1,000,000 for VA hospitals and VA homes. Often referred to as “The Greatest Fundraising Arm of the American Legion Family“, the Sons of The American Legion as a national organization annually raises the most money for our veteran’s and children’s charities. Often times, the contributions of the Sons exceeds the totals of The American Legion and the American Legion Auxiliary combined. 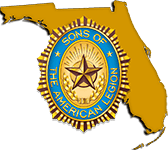 As a program of the American Legion, members of the Sons are entitled to many benefits that are provided to Legionnaires. Some of the benefits available include discounts on insurance, auto rental, and travel and lodging. Other benefits include discounts at Office Depot/Office Max. Sons members are also eligible for The Legion Insurance Trust and the National Emergency Fund. The Sons of the American Legion has a broad range of programs for Family, Youth, Community and National Affairs. With over 27 different programs, we’ve got you covered from the baseball diamond to our nation’s borders. Additionally, we make a difference not only within our local communities, but nationwide as an organization. Below are quick links to view the latest membership reports. Membership reports are updated on Thursday of each week. Communication is the key to all we do. Use the button below to join the Detachment of Florida Email Group. Your email address is safe with us. The Detachment of Florida will never give information to outside parties. If you are considering running for a Detachment Officer or District Commander/Vice Commander position for the 2019-2020 year, it's time to start submitting your endorsement letters. In order for an endorsement to be posted to the Detachment Newsletter “The Source” or the Detachment Website, an endorsement letter must meet the following requirements. Each endorsement letter must come from a Florida Squadron or Post and must be signed by the Squadron Commander and Squadron Adjutant, or the Post Commander and Post Adjutant or any combination of these. The letter must be on Squadron or Post letterhead and include the date that the Squadron or Post made the endorsement and that the membership approved said endorsement. This letter should contain information explaining why the individual should be considered for the office he is seeking and a narrative of positions held to show his leadership potential.